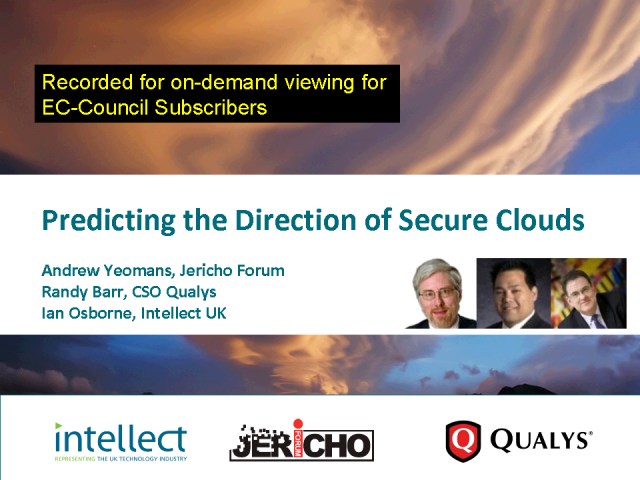 Roundtable discussion on the direction of secure clouds. Do you use a cloud platform today? What is your most important expectation of Cloud providers? Will further regulation help or hinder security in the Cloud? What is the greatest factor in deciding what data will be placed in the Cloud? Andrew Yeomans is Vice President of Global Information Security at Commerzbank (formerly Dresdner Kleinwort investment bank). Andrew is on the management board of the Jericho Forum, which is an international information security thought-leadership group. Andrew is also is a member of the Executive Advisory Board of the ISSA UK chapter and Infosecurity Europe Advisory Council. As Chief Security Officer (CSO) of Qualys, Randy is responsible for security, risk management and business continuity planning of the QualysGuard platform used by thousands of organisations worldwide. He will also lead the Qualys CSO Advisory Board efforts to collaborate with customers on forging and implementing security and compliance best practices. Randy has over 13 years of information technology and leadership experience. Prior to joining Qualys, he was the Information Security Officer at Yodlee responsible for insuring a high-level security posture of Yodlee's Internet based financial services. Ian Osborne is Director of the Digital Systems Knowledge Transfer Network, a Technology Strategy Board funded programme operated by a consortium led by Intellect with QinetiQ and National Physical Laboratory. The Digital Systems KTN launched in October 2009 and is initially comprised of three programmes: Cyber-Security, Location & Timing and Scalable Computing. The new KTN is working closely with Digital Communications KTN and leading industry suppliers and innovators with a brief to address the needs for promoting ICT-based innovation in private and public sector organisations.